I have to say that I am extremely proud of Pierre, after 4 summers sailing together and over 3000 miles sailed since May 2017, I can see now how knowledgeable he is. He is painstakingly preparing any single trip, he is proactively checking the boat constantly. As a sailor partner, I thought he was exaggerating, but he was not. You will never get a perfect trip: sailing depends on a lot of factors and you have to always be ready to repair something. Being proactive and planning really help with regard to safety and to enjoying sailing. The more you anticipate the better. In Cartagena, we had a very intense social life and we needed a couple of days anchored at La Azohía to recover from that. We went to La Azohía with our Brazilians friends sailing on Wanderlust. Together, we celebrated Marina’s 10th birthday. La Azohía is a nice village west of Cartagena. On our way to Garrucha, we suddenly hear a loud noise from the engine (we were motoring). We put the engine in neutral, the noise stopped. We inspected the engine and sail drive compartment, and nothing could be seen or smell. We stopped the engine and did some cold thinking. We decided to check the propeller. I jumped into the big blue, tied with a line to the boat (going half a knot, push by the wind) and a diving mask. All I could see was a small but thick plastic bag wrapped around the rudder. It is pretty scary to be in the middle of the blue, even if you are tied; it is something that I do never got used to; still I prefer to be in the water with Pierre to help me get back on board. So that was it: a plastic bag got caught into the propeller, and the loud noise came from the clutch. When we put the engine in neutral, the propeller folded (the propeller folds to reduce friction while sailing) and the plastic bag was released… and caught again but the rudder which is just back of the propeller. 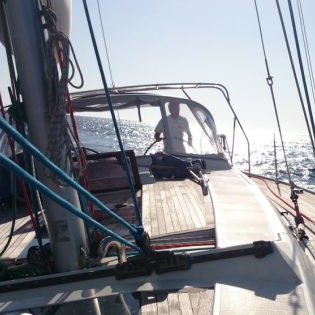 In Garrucha, our water heater broke again, Pierre spent one day fixing it (a trial and error process with a camera to control the work) and we stayed some more days checking that everything was working fine before passing Cabo de Gata. Everything was working fine. When sailing to “Cabo de Gata” the heater broke again. The 3 times, the rubber seal burst while motoring: the boat’s engine heats the water slightly more than the electric resistance does, and the seal, for whatever reason does not handle that well). Nothing serious but Pierre is tired of fixing it. It’s just too old and/or badly designed to be reparable. Cabo de Gata is a natural reserve, the beaches seem to be gorgeous, we anchored in San Miguel Cabo de Gata, to have a good rest before an overnight sailing to Gibraltar. I loved San Miguel Cabo de Gata view from the sea, the village is very wild and colourful. After 2 days and 1 night sailing, we did not feel comfortable arriving to Gibraltar by night. We changed our initial plans and went to Estepona for a night. This time, we saw dolphins at night, it was magic during the night shift to see dolphins around me. From Estepona (where we discovered the first tides – around 60 cm), we went to Alcaidesa Marina, close to Gibraltar. After the first tides, we started experiencing the strait currents, sometimes against and sometimes with us, also creating standing waves. We spent a great weekend in “La Alcaidesa” marina, my family came to visit us for a day! We met again with “Luna Bay 2” crew from France and we went to visit Gibraltar together, kids loved to see the monkeys! We also spent a very nice evening with “Flying” from UK and “Tranquilo” from Australia. We were having again an intense social life in the marina! If you have a chance to go to “La Alcaidesa” do not miss a meal at the marina’s bar! We went to Cádiz (with a stop in Barbate for the night) with Luna Bay 2 and we spent 3 days celebrating with tapas and drinks our successful entry into the big ocean. We were sad to say goodbye to Luna Bay 2 crew. We had great moments together and we learnt a lot of from them. Kids really got on well together. It was wonderful to spend time together. We love meeting other families, kids are very excited to have new friends. We have to stay in Cádiz to get a new sail done and to enjoy the family. Luna Bay 2 is waiting for the good conditions to sail to the Canary Island, and enjoying Portugal in the mean time. We are now in Cádiz, where we will leave the boat for a couple of weeks while we are visiting our families – and getting work done on Soledad. I’m so interested of reading about your travel Maria! Really a big change in your life. Keep posting about the nice place you visit and about your experiences! I’ll keep following you. Big hugs and all the best to your family. Bon courage et profitez en . Oui! On profite bien ! J’espère que vous allez bien. Bisous ! I just can’t believe you are thanking us for reading and following you!!! We are the ones who thank you for sharing your great adventures with us! It is always such a great pleasure to read your articles – a bit if fresh air from the sea, really. I am enjoying every single word of my reading and it is as if I were with you guys. So pls keep up the good work, look after yourself and make the most of this fantastic trip! ln Portuguese: obrigada por comentários generosos sobre minha família que escolhi.Minha irmã Cris, minha sobrinha Marina e meu cunhado Marcelo.